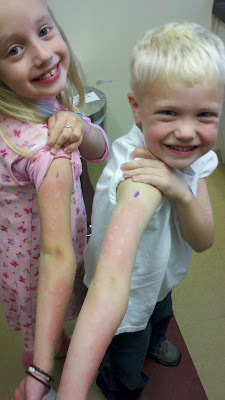 On Wednesday, Caroline and Bryce had a checkup with the allergist. Dr. S told us at our last checkup that he wanted an updated allergy skin test done on both of them the next time he saw us because it had been so long since each of them had their last one done. I also had a feeling that he was going to start drilling us about the possibility of allergy shots. You can see how big the bumps are! Poor kids. Thankfully they were troopers and I was able to keep them distracted with a juice box, some Halloween candy, and lots of arm flapping. As expected both kids are still super allergic to many things although Bryce takes the cake for tree pollen allergies. Caroline continues to be allergic to horses (ha!) and Bryce now has a new allergy to rabbits. Both results made me laugh since I don't think either kid has touched a rabbit or a horse! However, upon seeing the results and knowing their ages, Dr. S recommended we start allergy shots. Ugh. Upon hearing that they would get weekly shots for 18 months and then monthly shots for 3 more years after that, Caroline got a bit upset. And I understand - for a kid a shot is a big deal. And even though my kids have always been great about their vaccinations, the thought of weekly shots for that long is overwhelming. The biggest issue for us is going to be the logistics though - how much insurance will cover and actually getting them to the office. The good news with the office at least is that they are moving to a better location just down the road so much easier to get in and out of, but still not terribly close. I told the kids the earliest we'd be starting would be after the holidays but I need to figure some things out first. If it was just Caroline, I might consider not doing it since her allergies are completely manageable with meds. But poor Bryce's are not. In addition, with the add-on of allergy induced asthma two years ago, I'd kind of like to take asthma out of the picture altogether. I also think of him as a teenager and wanting to play baseball or something like that and how miserable he would be. We have to turn the A/C on in April and put him on 3 additional meds just to keep him from feeling like total crap - and even that doesn't totally work. Dr. S also said that allergy shots with kids are very effective unlike they can be for adults because of their immune systems still forming. An adult doesn't have a guarantee that they will work whereas a kid my kids' ages will be practically allergy free after about a year or so. One thing I'm keeping in my back pocket to help Caroline deal with this is the fact that when she is done with allergy shots, she will no longer be allergic to cats. (I will still be though....) I'm going to remind her that because of that, it means that when she moves out of the house one day, she can get a cat without any worries. Maybe that will help ease her pain a little. Every week for 18-months? OMG. I can't imagine the logistics of that. Sigh. Hugs.